Most white tortilla wraps contain high amounts of carbs and provide little or no dietary fiber. Many contain little or no fat, however, and most contain no cholesterol. 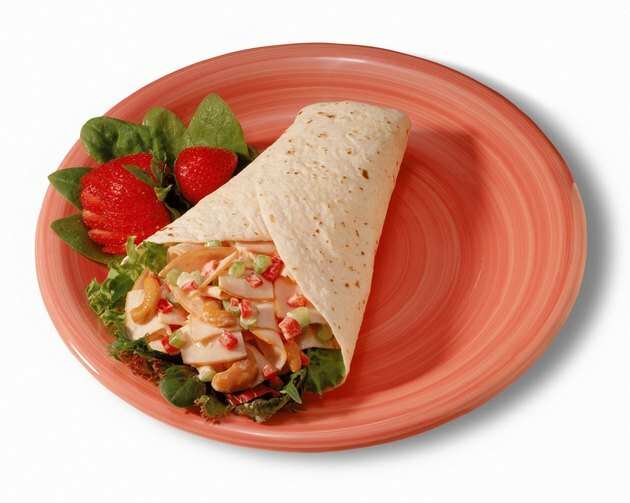 While white tortilla wraps provide small amounts of some nutrients, whole grain wraps provide a healthier alternative. Remember that whole grains should account for at least half of your daily grain intake, according to USDA's MyPlate.gov. The calorie content of white tortilla wraps varies according to size and brand. An 8-inch white flour tortilla sold commercially typically contains about 120 calories. Low-carb, multi-grain alternatives to white tortillas typically contain fewer calories, with only 60 or 70 calories per 8-inch tortilla. Larger white flour tortillas used for burritos at restaurants might contain as many as 290 calories. Commercially available 8-inch white flour tortillas typically contain about 22 g of carbs each, including 2 g or less of dietary fiber. Most white flour tortillas contain little or no sugar, with 1 g or less per tortilla. Low-carb and multi-grain tortillas contain fewer grams of carbs, often only 11 g per serving, and provide much better sources of dietary fiber, with 6 or 7 g per serving. Large white flour tortillas used for burritos at restaurants can contain as much as 44g carbohydrates and only 2 g of dietary fiber. Dietary fiber promotes healthy digestion and provides a feeling of fullness with fewer calories, making it easier for you to control your weight. The Harvard School of Public Health recommends that women get at least 20 g of fiber per day and men at least 30 g per day. Most white flour tortillas contain little fat. Commercially available 8-inch tortillas typically have 1.5 g or less of total fat, and they often contain no saturated fat or trans fat. Most tortillas contain no cholesterol. Larger tortillas used at restaurants might contain significantly more fat, with as much as 9 g of total fat and 3 g of saturated fat. White flour tortillas provide some protein and minerals. Commercially available 8-inch white flour tortillas provide about 4 g of protein, and as much as 10 percent of the recommended daily intake of iron and calcium. Larger tortillas used at restaurants can provide as much as 7 g of protein, 20 percent of your recommended daily calcium intake and 15 percent of your recommended daily iron intake. White tortilla wraps do not provide good sources of essential vitamins. USDA’s MyPlate.gov: What Foods Are in the Grain Group?